Mubi South and Maiha LGAs did not only stop in Yola but went as far as Ganye LG and Lamurde with no means of Livelyhood and as a result had to result to menial jobs in order to earn a living. Most of them had no accommodations and have to squat in make shift rooms or uncompleted buildings with no social amenities . It is also imperative to note that IDPs to a large extent have increased the social problems in Adamawa State and in Nigeria. While a good number of them with entrepreneurial skills fend for a living selling recharge cards, hawking water, selling fruits, shining shoes etc. a good number of them have become criminals in nature engaging in stealing, robbing and drug addiction. Quite a number of the girls have resorted to prostitution which appears an easy way out. The case of prostitution can be attested to by a visit to all the joints at night where by midnight very young girls offer themselves for a meal and bed to sleep in. The plight of the IDPs especially the young is multifaceted . Many of them have lost their parents and are to a large extent disconnected from all family ties. Some as a result of their experiences are psychologically traumatized and have become a social problem that needs psychiatric attention. Some of the IDPs have resorted to crime thereby causing serious security problem. Like the “Yan Shila” hoodlums that have become a major concern to Security and protective agencies in the state capital . Theses hoodlums mostly in their teens and early twenties wield knives and would stab and injure or even kill just for a handset or a purse. The activities of these young hoodlums have created fear and a new dimension in the way security agencies operate. The ruthless attitude of these hoodlums has been a major concern for protective agencies and the population at large. All state security services have developed an attitude of dealing stringently with young suspects because quite a number of them pose a serious threat to the society at large. To a large extent, the local population view homeless young persons without compassion because an impression has been created about their potential of being dubious and criminal. Assistance that could be rendered in normal circumstances has been denied due to the fear of what such youth would manifest into. 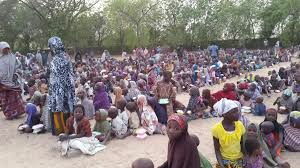 The plight of the Internally Displaced Persons (IDPs) more especially the young is that their academic pursuits have been truncated leaving them vulnerable to social vices. Several institutions including Primary schools, secondary school and tertiary institutions are yet to recover from the effect of the Boko Haram insurgency and the farmer herders clashes that have also become a major concern in Adamawa, Taraba and Benue States. The cumulative effect is that if nothing is done to correct this problem, an army of half educated youth will constitute a major problem to the society. In view of the aforementioned , it is incumbent on the Government to find means of sustaining, resettling and rehabilitating displace persons to enable them pick up the pieces of their lives that have been disrupted by the religious and socio economic problems that have resulted in violent conflicts. Police Public relations officer Othman Abubakar opine that a lot of them have already blended with the society and it will be difficult to pick out such people since the police cannot just go on an arresting spree of suspicious persons. Non governmental organizations such as the Search For Common Ground (SFCG) needs to be encouraged to render assistance to vulnerable youths that constitute a large portion of the Internally Displace Persons. Those that cannot go back to schools should be trained in various vocations to enable them live a crime free life. The ability to rehabilitate IDPs can only be achieved if proper records are kept.